I love arugula and am always looking for new ways to enjoy it. When I recently tried this great beet and goat cheese salad, I was hooked. It’s now one of my weekly go-tos. To prepare dressing, puree all ingredients in a small blender or food processor. Cover and refrigerate until ready to serve. Preheat oven to 400° F. Rinse beets and cut tops off if still attached. Wrap each in foil, leaving room for air to circulate. Place on a baking sheet and cook for about 50 minutes or until beets are tender when pierced with a sharp knife. Let cool, then slip off skins. Discard ends and slice beets 1/4-inch thick. Place arugula in a large shallow bowl and toss with half the dressing. 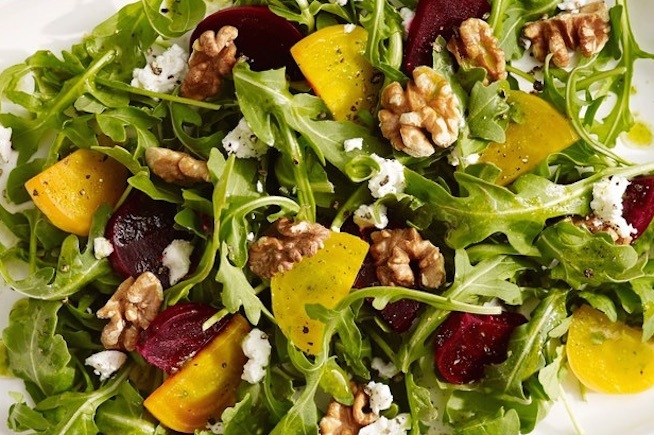 Layer beets over arugula and drizzle with remaining dressing. Top with walnuts and cheese and season with pepper.